No, no, no, no…! We do not want to teach kids to swing down, or up for that matter. Try to correct them when they make it to high school. Not easy. Teach matching the swing plane to the pitch plane and forget about capitalizing on infield errors. Is winning a Little League game that important? I can’t argue with the results achieved by J.D. Martinez in recent years, however, I first questioned why the Red Sox would draft him as he is a opposite field hitter (not what you would be looking for with the Green Monster staring at you at Fenway 315 feet away) but he conquered right center field at Fenway Park. Not sure of the stats but I’d say that most off his HRs are to the right of center field, particularly on fastballs. I’d venture to say that his HRs to left field are on offspeed pitches. In looking at his swing, he hits almost out of a Power V, arms almost extended at contact in the shape of a V. Is it me, or is he coming off pitch plane? We have had this conversation numerous times about the role of the front shoulder, elbow, and hand in setting the pitch plane. How can he pull a high velocity MLB for a HR with a swing like that? Also, something you have emphasized, it seems that he’s violating Kelly Starrett’s one-joint rule. Joey, you have the best stuff out there and you have connected the dots – with your spinal engine references, hunch posture, ‘X’ pattern, etc. – between Ted Williams’ SCIENCE OF HITTING and the Epstein hitting system, the pioneers in this discussion. Joe, I think what JD Martinez does well is matching the plane of the pitch. The goal of batted ball coming off the bat same height as ball comes in. That has a lot to do with his well above .300 BA. Thanks for your continued support my friend! Can’t argue with the results. Martinez just looks different in doing that, something that I might not teach. His swing is similar to Bryant. Judge, Betts, Donaldson, Turner, Pujols, and others don’t look like Martinez at contact. Their arns are positioned differently than Martinez’s arms. If ball is 1-foot off ground at impact, then it comes off bat 1-foot off ground. If ball is 5-feet off ground at impact, then it comes off the bat 5-feet off ground. It’s a swing intention. What about the launch angle? 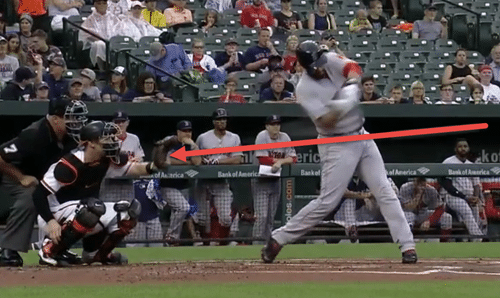 A 30 degree launch angle would take the ball higher, no? Yes Joe, homerun launch angles, depending on ball exit speeds, are between 25 and 35 degrees. Ball exit speed is king though. So I like my hitters’ batted ball direction intent to be same height as incoming pitch (from ground at time of impact), so they protect themselves from the non-productive popup. If we use our spine does it matter… If we use our lead side to get on plane and our rear side to Hulk smash… Than what???? Our forearms should be fighting to see which ones breaks the handle…. Babe Ruth, Ted Williams, Bonds, and Donaldson dropped/drop their hands. Martinez amazes me. Power V swing, head position, and above 90 degree back leg angle are something you wouldnt teach a hitter. There are ranges of movements. The more I see, the more this is more apparent with human movement. However, there are boundaries to those ranges, and beyond that we start to move into the unhealthy or ineffective range. By the way Joe I love “dropping my hands” as long as I stay connected… If I could I would have my hands touch the ground so as long as I stay connected…. Haha, the hands can drop but they must be moving forward as well. Of course, spinal engine drives everything, but that doesn’t mean compensations don’t occur outside of that engine that must be fixed and put back on the right path.